What makes the steering in this car almost "magic"? What is it? The steering wheel? The rack? Suspension? Car dimensions? What the heck makes it feel so good? Believe it or not our car is a direct decedent of Pegasus and his wife, the Unicorn. In all seriousness though...I've had my car for about 2-3 months now and I completely agree with you. I've ridden in plenty of track ready car's and while I understand they're MADE for the track our car IMO handles superb. I've got H&R coilovers and the drive is perfect. I would blame it on everything you listed. BMW has always had a knack for building track cars, Germany = Nurburgring, plus when you pay 60k for a car (Brand New) you know there has been extensive R&D done for it in ALL aspects. Side Story: I was at the Car Wash the other day vacuuming when an older guy comes up to me and asks what year my car was. I told him 01' and continued vacuuming while I still had time for the $1.25 I paid. After I was done he asks how much power it makes stock, I tell him 300 and he say's "that was quite a bit of power back then" and I reply "It's quite a bit of power now." Purpose: It's crazy how 10 years have passed and our cars STILL to this day compete with cars being built today. Find More Posts by ¿safxtacy! Yeah I also wonder what kind of steering DNA is there to make it feel so nice and precise. ///M3AN ONE Headers, vogtland/koni, UUC Swaybarian sway bars, Matte Black CSL Reps, SS Race, PF fcab/rtab, black grills/corners, CSL diffuser, Umnitza v2, aluminum paddle shifters, Germany rear and side badges , 2x Earthquake SWS 12", K&N 57, iSimple ipod hookup. It is a great car for sure. That's why I don't want to alter it too greatly with modifications. 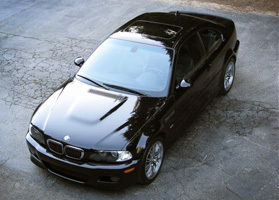 2004 BMW M3 Coupe. Silbergra Metalic. Ohlins/Vorshlag. GSP SMG Brake Pedal. Apex Arc-8. Carbon Fiber (sunroof delete). What year is your M3? My 2002 M3's steering feels heavier than my friend's 06. I think there was a change in the steering ratio after a certain year. It's funny, coming from an E36 with poly FCAB's and RTAB's, TCK Coils, nearly ever suspension piece replaced and lightweight wheels, I felt that my E46's steering was a little numb. I've since warmed up to it more, but I wonder if it could be improved with coils(not going poly bushings again, squeaking is unbearable). My 2002 M3's steering feels heavier than my friend's 06. IMHO that should be a good thing! Yep.... everytime I modify something suspension related I end up not liking the car as much and then go back to a "mostly" stock configuration. Sure, the mods help sharpen/stiffen/tighten up certain aspects of the handling, but always at the expense of that great feel these cars have.... it's precisely that feel that sets them apart from others. 2018 F80 M3 ZCP 6MT AW/Black Cloth "stripper"
Last edited by EricSMG; Sun, Oct-10-2010 at 01:54:12 AM. All times are GMT. The time now is 12:16:47 AM.